Vijita Kamath dreams of working on Wall Street. 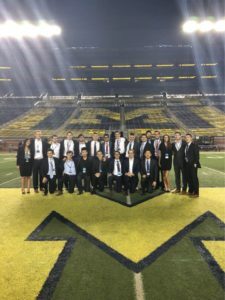 But before she gets there, the U-M junior studying finance and math plans to change the industry from right here in Ann Arbor. 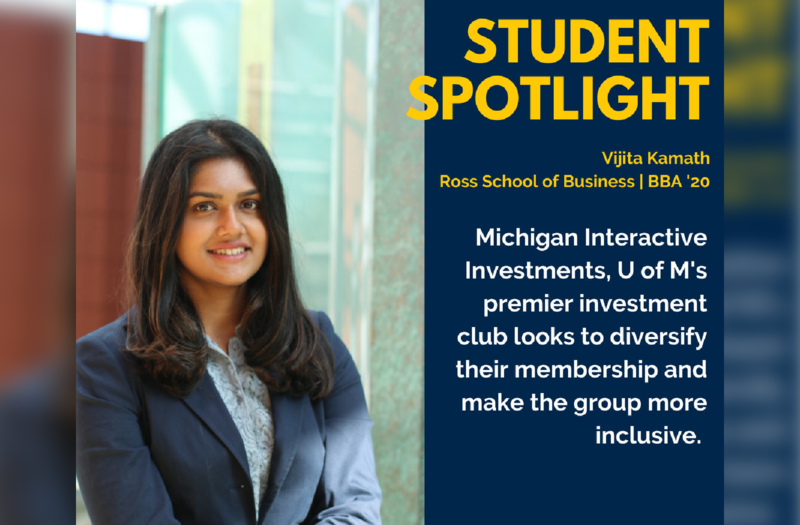 Kamath serves as vice president of new member relations for Michigan Interactive Investments, an investment club for undergraduate students at the Stephen M. Ross School of Business. The role includes heading up recruitment efforts for the highly selective organization. “I aspire to shape the future of Michigan Interactive Investments by developing a membership base that encompasses a range of majors, identities, nationalities, genders and interests to send our message that anyone who is passionate about investing will find a home in Michigan Interactive Investments,” Kamath said. Kamath’s goal is ambitious, despite initially having her own reservations about applying for membership. Wall Street and the financial services industry are known for their male-dominated cultures, and almost all of the top banks in the U.S. are run by men. “I was scared about feeling like an outsider, not being taken seriously, or being treated as a token female member,” she said. A recent study published by Catalyst, a nonprofit organization that focuses on advancing the careers of women, reported that women account for less than 17 percent of senior leaders in investment banking. In private equity, women make up only 9 percent of senior executives and 18 percent of total employees, according to a 2017 report produced by data and intelligence agency, Preqin. At hedge funds and private debt firms, the numbers are similarly low — women fill just 11 percent of leadership roles. When it comes to achieving gender equality, finance has not kept pace with many other professional fields, such as law, academia and medicine. That is despite the fact that women now receive the majority of college degrees issued in the U.S. at every level, from bachelor’s degrees to doctorates. Kamath said she understands that declining numbers among women studying finance paired with low job satisfaction, calls for creative solutions to combat the problem. With a considerable gap in the presence of women in the financial services industry as decision makers, in front of and behind the scenes, advocacy groups say representation matters. Advocacy and mentorship are important pillars in transforming perceptions and solidifying more seats at the table for women. Kamath and the investment club’s leadership aim to increase the proportion of women and minorities applying to the club, as well as reach out to different majors on campus. “A psychology major will look at an investment in a different way, an engineer might understand a company and a biology major can give us perspective on processes in different industries,” Kamath said. Michigan Interactive Investments has already taken the first step to make the process more inclusive to people without prior finance experience by rethinking the application process. They have also organized a special diversity panel and plan to share their goals on Sunday, Sept. 9. Prospective members can interact with current members in an informal setting and receive support with their applications. To make the group more inclusive, considerations are also being made for those who in one way or another represent a minority group. “We have a comprehensive program for new members to help them fully integrate into the club and build camaraderie,” said Alexander Rein, the club’s president. Every year, the club organizes the ENGAGE Undergraduate Investment Conference, the largest collegiate investing conference in the country. Kamath said the groups has made a conscious effort to work with organizations like the Forte Foundation and Girls Who Invest. Both non-profits are dedicated to developing a pipeline of women prepared to take on significant and fulfilling careers in finance and business. The club has also worked to increase the number speakers at the conference who are top female executives in the industry. This year’s conference includes Fahmi Quadir, founder of Saftkhet Capital Management.Kamath said both men and women benefit from seeing more women acting as leaders and decision makers within the industry since they bring different perspectives and experiences.